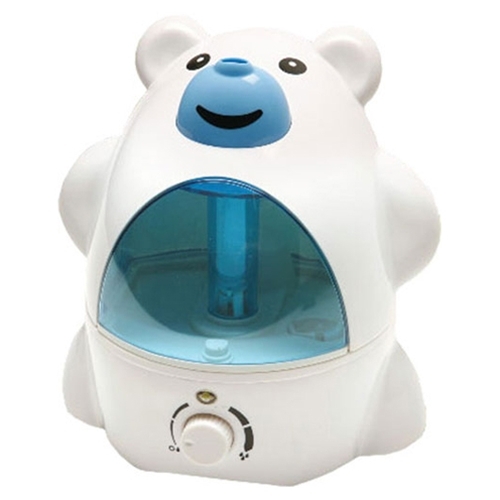 Sunpentown Polar Bear Ultrasonic Humidifier from HealthyKin.com helps your little ones breathe easier by adding moisture to the air. A humidifier will help achieve the ideal conditions to sleep well at night and provides year-round relief from the drying effects of an AC or Heater. Ultrasonic technology makes it noiseless and the fine atomization lasts about 8 to 10 hours. Features super-quiet operation, overflow protection and auto shut-off protection (with no audible alarm) - the perfect addition to any room. Very Cute! It is in my daughters room and it is helping with her dry skin.